Perrin's Blend is an all natural ointment for skin lesions and specific spots of abnormal skin growths. Creme Complete is a corrective cream for larger areas of sun damage and other problem areas. 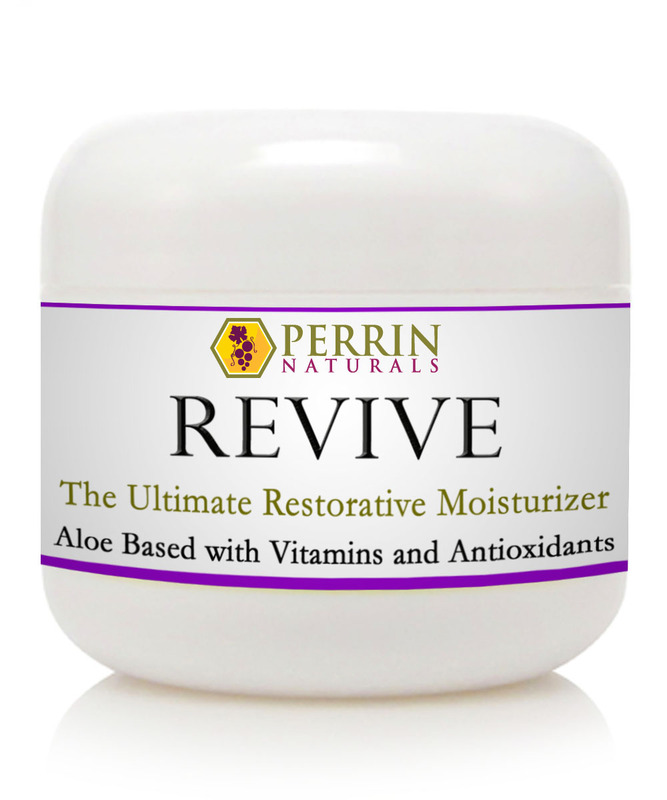 Perrin's Blend is a simple, all natural, antioxidant, grape seed extract ointment. Perrin's Blend contains 5 ingredients in a base of honey and grape seed oil. Perrin’s Blend™ is a thick sticky burgundy colored ointment used to correct specific spots of abnormal skin growth: skin lesions, moles, actinic keratosis, warts. Most of the customer testimonies that concern actinic keratosis and skin lesions involve the Perrin’s Blend™. Perrin’s Blend™ usually needs to be covered with a bandage. We have seen the best results when the place being treated is in constant contact with Perrin's Blend™ 24 hours a day. That usually means covering the area with a bandage to prevent the ointment from being rubbed off. We have also seen better results when the place remains covered when bathing to prevent a deep cleaning of the area, resulting in all the ointment being washed off on a microscopic level. We recommend changing the bandage after bathing and applying a new application of Perrin's Blend, and to avoid having a wet bandage on your skin. Blister Band-aids are a good option as they are waterproof and do not need to be changed as often. Keep in mind that this is the optimal approach. The area will need to be washed off periodically to prevent a build up of adhesive and for general sanitation purposes. If a growth is on a person's face then it may not be necessary to cover the area since the Perrin's Blend would probably not be rubbed off as easily as it would be on other areas of the body. Sometimes Perrin’s Blend™ is used at night, and the Crème Complete™ during the day. Raw honey, grape seed extract, ascorbic acid, n-acetyl cysteine, alpha lipoic acid, vitamin E, grape seed oil. Apply Perrin’s Blend on the designated area and cover with a bandage. Do not wash off. When bathing keep the affected area covered. After bathing reapply Perrin’s Blend and cover with a new bandage. Perrin’s Blend can be applied daily or as often as desired. We recommend applying at least twice daily. Separation may occur over time so it may be necessary to stir periodically. Avoid contact with clothes. Perrin’s Blend will stain. Although Perrin’s Blend has an extended shelf life we recommend using it within one year. Some customers take a grape seed extract supplement. Results vary, as does the condition being treated, and the diligence and consistency of the application. -Skin lesions. It can take anywhere from 1 week to 3 months to see results, and some customers have to use the product for even longer. On average customers usually see results in 3-6 weeks. -Actinic keratosis. Most of our customer feedback indicates about 3-6 weeks of usage. Most of the time skin lesions and sun-damage do respond to our products, but there are of course times when a person’s condition does not respond. Perrin’s Blend was developed by Judy Perrin without the intention of ever marketing or selling it. It was originally formulated after prayer in response to a lesion (diagnosed as squamous cell carcinoma) which had developed on her husband’s ear. She shared the product with friends, but it was only after numerous success stories and several years that the decision was made to start distributing it on a wider scale. It is now carried in over 100 stores in 30 states and 6 countries. Judy and Jim Perrin give their testimony on video. Click here to see video.